Zhong Yong promotes it, Da Xue illustrates it, and Daodejing relies upon it... thinking. Think... to think... a very small word, easily recognized by most English-speaking people, but so rarely self-applied for most people. Think... thinking... to think... not known to be promoted within any modern culture, nor promoted within any known European history... not known to be permitted within any known ideology. If, thinking were common — if, thinking was a thing that was done by most all people — then there would not exist writings of Confucianism, nor 大學 (Da Xue - Great Learning), nor of 道德經 (Daodejing). The writings exist. Repeat... the writings exist. The writings exist, because, thinking is not common. The sensory quotient test — purposefully given the misnomer for the purpose of helping to prevent individuals from inventing answers that might occur if the participants knew that the test was a cognitive test — portions of the test presented to hundreds of thousands of people, proved that only about one person in ten-thousand is able to adequately describe anything. Cannot describe a thing, if cannot think. The cognitive ability, to think, is very uncommon. Daodejing sentence portion: 魚不可脫於淵. Quick, uncareful, draft, knee-jerk translation... 'Fish not able escape from deep-pool'. Fish... surely an easy word... surely... but, maybe not for people who are unable to think. Fish... very simple word... known to most all people who have personally seen a fish in water, or memorized the word and also saw a picture of a fish. Water... also, ought to be an easy word. Most people, cannot describe water, even though people must drink water to stay alive. Most people, cannot describe life's most important necessities... the people cannot think. Fish and water... surely, ought to be a rational concept. Fish not able leave water... again, ought to enable a rational conclusion. Why are the words so difficult to some people? Describing a fish... describing water... describing, how the mind reasons why fish not leave water... each of the three, must exist, else, not able to recognize Daodejing's six words... not able to think. Goddard translation: "The fish would be foolish to seek escape from its natural environment". Legge translation: "Fishes should not be taken from the deep". Suzuki translation: "As the fish should not escape from the deep". Glancing at over a hundred translations, none seen had only six words, nor only six concepts. Some translations completely omitted 'fish' and 'deep-pool'. Why are little words so difficult for some people? Not able to describe their sensory perceptions? Not able to observe their own thoughts? Not able to think? Yes. One act of thinking, exceeds all spoken and written words of all languages of all cultures of all eras all combined into one moment. Most people cannot reason that, because, most people cannot describe anything... therefore, not know what a thought is... not know, what thinking is. Necklace... a thing worn around one's neck, often having a clasp that can be connected, to hold the necklace around one's neck. Necklace... undo the clasp... the necklace 'string' is then open... connect the clasp... the necklace 'string' is then closed. Open... close... open... close... surely most people are able to mentally grasp what 'open' and 'close' imply. Some people, however, are unable to think... their minds are unable to reason for one's self... and the people are not able to rationalize the difference between 'open' and 'close'. Not able to think. Grown adults, graduating from MIT, some have been reported to be unable to make light with a battery, bulb, and wire. The university graduates, are unable to think... not know necklace open-close... not able to cross-light memorized words... not able to think enough to self-create a concept of open-close. Neither a technology university degree, nor the highest grades in technology classes, infers that the graduates are able to think, nor able to mentally reason the difference between an open electrical circuit, and a closed electrical circuit. To be granted a title of Confucian Scholar, does not infer that the individual knows anything about Confucianism. To be granted a title of Doctorate of Technology, does not infer that the individual knows anything about technology. If an individual cannot self-observe how they know a necklace string is open or closed, then the individual cannot know what thinking is. Many people sincerely do believe that reciting a few memorized words is thinking... the people cannot think. Fish not able leave water... easy? If easy, then why did all academic translations not understand? If the academicians understood, then the academicians would have also understood the following sentence portion that relied upon an understanding of 'fish not able leave water'... over one-hundred academic translations... none understood... no academic translation was able to mentally grasp, mentally hold, mentally retain, then mentally connect, and mentally relate 'fish not able leave water'... academic translations... not able to think. Laozi understood... Laozi, able to think. 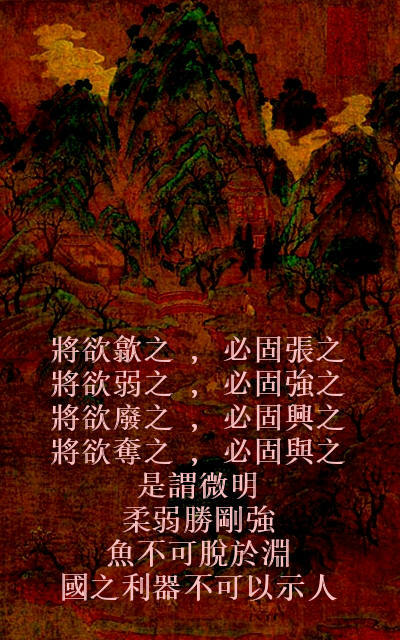 If most people could think, then there would not exist writings of Zhong Yong, nor Da Xue, nor Daodejing. The writings exist. The writings exist, because, thinking is rare, and because the writings aimed to embarrass, and to prod, people into thinking.